In 1911, physicist Heike Kamerlingh Onnes aimed to lower mercury's temperature to as close to absolute zero as possible. He hoped to win a disagreement with Lord Kelvin, who thought metals would stop conducting electricity altogether at extremely low temperatures. Carefully manipulating a set of glass tubes, Kamerlingh Onnes and his team lowered the mercury's temperature to 3 K (-454 F). Suddenly, the mercury conducted electricity with zero resistance. Kamerlingh Onnes had just discovered superconductivity. This single finding led to a worldwide investigation that's spanned a century. While it resolved one scientific debate, it created many more. The Department of Energy's Office of Science and its predecessors have spent decades supporting scientists investigating the mystery of why superconductivity occurs under a variety of circumstances. The answer to this question holds major opportunities for scientific and technological development. About six percent of all electricity distributed in the U.S. is lost in transmission and distribution. Because superconductors don't lose current as they conduct electricity, they could enable ultra-efficient power grids and incredibly fast computer chips. Winding them into coils produces magnetic fields that could be used for highly-efficient generators and high-speed magnetic levitation trains. Unfortunately, technical challenges with both traditional and "high temperature" superconductors restrict their use. "To the extent that Tesla and Edison introducing the use of electricity revolutionized our society, ambient superconductivity would revolutionize it once again," said J.C. Séamus Davis, a physicist who works with the Center for Emergent Superconductivity, a DOE Energy Frontier Research Center. Kamerlingh Onnes' discovery set off a flurry of activity. Despite his grand visions, most of what scientists found only reinforced superconductors' limitations. One of the first big breakthroughs came nearly half a century after Kamerlingh Onnes' initial finding. While most researchers thought superconductivity and magnetism couldn't co-exist, Alexei A. Abrikosov proposed "Type II" superconductors that can tolerate magnetic fields in 1952. Abrikosov continued his research at DOE's Argonne National Laboratory (ANL) and later won the Nobel Prize in Physics for his contributions. The next big leap came in 1957, when John Bardeen, Leon Cooper, and John Robert Schrieffer proposed the first theory of why superconductivity occurs. Their theory, made possible by the support of DOE's predecessor, the Atomic Energy Commission, also won them the Nobel Prize in physics. Their theory contrasts how some metals work under normal conditions with how they act at extremely low temperatures. Normally, atoms are packed together in metals, forming regular lattices. Similar to the spokes and rods of Tinkertoys, the metals' positively charged ions are bonded together. 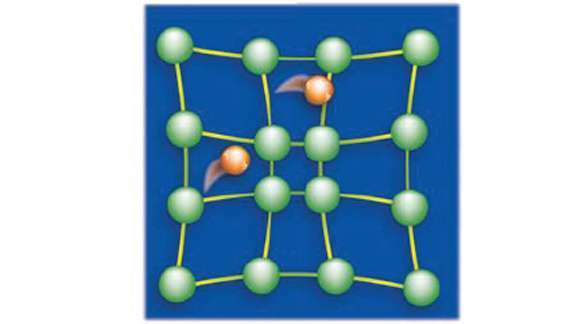 In contrast, negatively charged free electrons (electrons not tied to an ion) move independently through the lattice. But at extremely low temperatures, the relationship between the electrons and the surrounding lattice changes. A common view is that the electrons' negative charges weakly attract positive ions. Like someone tugging the middle of a rubber band, this weak attraction slightly pulls positive ions out of place in the lattice. Even though the original electron has already passed by, the now displaced positive ions then slightly attract other electrons. At near absolute zero, attraction from the positive ions causes electrons to follow the path of the ones in front of them. Instead of travelling independently, they couple into pairs. These pairs flow easily through metal without resistance, causing superconductivity. Unfortunately, all of the superconductors that scientists had found only functioned near absolute zero, the coldest theoretically possible temperature. But in 1986, Georg Bednorz and K. Alex Müller at IBM discovered copper-based materials that become superconducting at 35 K (-396 F). Other scientists boosted these materials' superconducting temperature to close to 150 K (-190 F), enabling researchers to use fairly common liquid nitrogen to cool them. In the last decade, researchers in Japan and Germany discovered two more categories of high-temperature superconductors. Iron-based superconductors exist in similar conditions to copper-based ones, while hydrogen-based ones only exist at pressures more than a million times that of Earth's atmosphere. But interactions between the electron pairs and ions in the metal lattice that Bardeen, Cooper, and Schrieffer described couldn't explain what was happening in copper and iron-based high temperature superconductors. "We were thrown into a quandary," said Peter Johnson, a physicist at Brookhaven National Laboratory (BNL) and director of its Center for Emergent Superconductivity. "These new materials challenged all of our existing ideas on where to look for new superconductors." In addition to being scientifically intriguing, this conundrum opened up a new realm of potential applications. Unfortunately, industry can only use "high-temperature" superconductors for highly specialized applications. They are still too complex and expensive to use in everyday situations. However, figuring out what makes them different from traditional ones may be essential to developing superconductors that work at room temperature. Because they wouldn't require cooling equipment and could be easier to work with, room temperature superconductors could be cheaper and more practical than those available today. Several sets of experiments supported by the Office of Science are getting us closer to finding out what, if anything, high-temperature superconductors have in common. Evidence suggests that magnetic interactions between electrons may be essential to why high-temperature superconductivity occurs. All electrons have a spin, creating two magnetic poles. As a result, electrons can act like tiny refrigerator magnets. Under normal conditions, these poles aren't oriented in a particular way and don't interact. However, copper and iron-based superconductors are different. In these materials, the spins on adjacent iron sites have north and south poles that alternate directions – oriented north, south, north, south and so on. One project supported by the Center for Emergent Superconductivity examined how the ordering of these magnetic poles affected their interactions. Scientists theorized that because magnetic poles were already pointing in opposite directions, it would be easier than usual for electrons to pair up. To test this theory, they correlated both the strength of bonds between electrons (the strength of the electron pairs) and the direction of their magnetism. 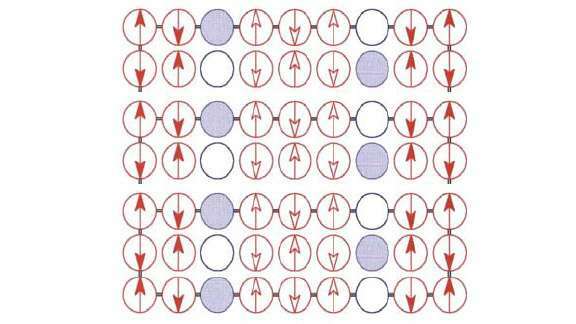 With this technique, they provided significant experimental evidence of the relationship between superconductivity and magnetic interactions. Other experiments at a number of DOE's national laboratories have further reinforced this theory. These observations met scientists' expectations of what should occur if superconductivity and magnetism are connected. Researchers at ANL observed an iron-based superconductor go through multiple phases before reaching a superconducting state. As scientists cooled the material, iron atoms went from a square structure to a rectangular one and then back to a square one. Along the way, there was a major change in the electrons' magnetic poles. While they were originally random, they assumed a specific order right before reaching superconductivity. At DOE's Ames Laboratory, researchers found that adding or removing electrons from an iron-based superconducting material changed the direction in which electricity flowed more easily. Researchers at BNL observed that superconductivity and magnetism not only co-exist, but actually fluctuate together in a regular pattern. Unfortunately, electron interactions' complex nature makes it difficult to pinpoint exactly what role they play in superconductivity. Research at BNL found that as scientists cooled an iron-based material, the electron spins' directions and their relationship with each other changed rapidly. The electrons swapped partners right before the material became superconducting. Similarly, research at ANL has showed that electrons in iron-based superconductors produce "waves" of magnetism. Because some of the magnetic waves cancel each other out, only half of the atoms demonstrate magnetism at any one time. These findings are providing new insight into why superconductors behave the way they do. Research has answered many questions about them, only to bring up new ones. While laboratories have come a long way from Kamerlingh Onnes' hand-blown equipment, scientists continue to debate many aspects of these unique materials.